These little bites are packed with flavor and can be prepared in less than an hour, making them the perfect solution to busy weeknights or last-minute company. Preheat your Evolve grill on Setting 4. Toss together red and green peppers, onions, 2 tbsp of the oil, salt and pepper. Grill sausages and vegetables, turning as needed, for 20 minutes or until sausages are cooked through and vegetables are tender; let cool slightly. Chop vegetables and slice sausage; toss with Cheddar and mozzarella. Arrange evenly over one side of each tortilla; fold tortilla over to enclose filling. 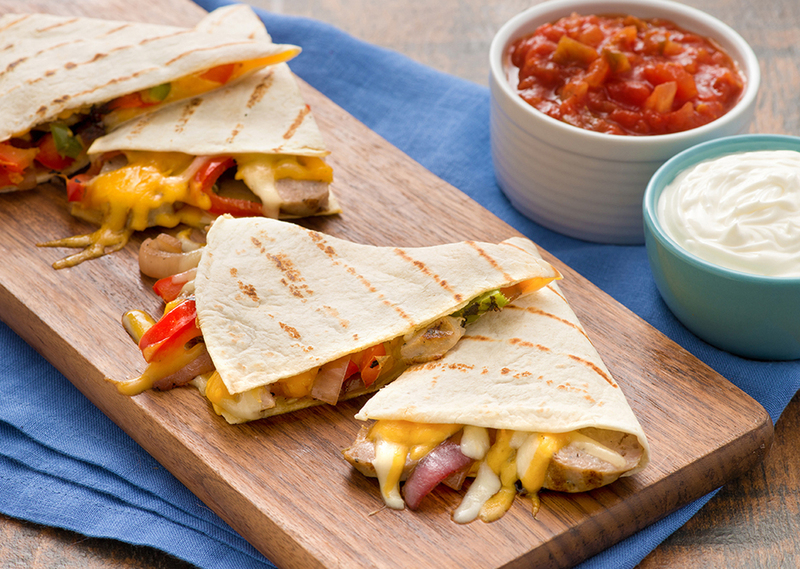 Brush outside of each quesadilla with remaining oil; grill for 3 to 5 minutes per side or until tortillas are golden brown and cheese is melted. Let stand for 1 minute. Cut each tortilla into 4 wedges; serve with sour cream and salsa. Tip: Omit sausage for a vegetarian-friendly version of this recipe.